The International Journal of Business and Commerce keeps readers up-to-date with the latest research and newest thinking in consumer goods in an easy-to-read, straightforward way. This unique journal bridges the gap between consumer goods industry practitioners (both retailers and manufacturers) and academics, to the mutual benefit of both sides. It brings academics' best work to the attention of practitioners, and it communicates practitioners' research priorities and interests to academics. The aim of the International Journal of Business and Commerce is to promote the understanding of managers and organizations within and across nations. It is an interdisciplinary journal directed towards academics, policy makers and practitioners in business and non-profit organizations. The journal aims to provide a forum to widen and deepen discussion about all areas of business and commerce as well as being readable, accessible and easy to use. 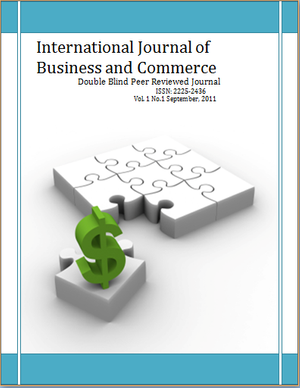 The International Journal of Business and Commerce is a double blind-refereed monthly and open-access journal that publishes empirical, conceptual and review papers of exceptional quality that contribute to and enrich Business and Commerce thinking and practices. Emphasis is given to papers that address controversial topics and which have a sound theoretical base and/or practical applications. All papers submitted should be original contributions and not under consideration for publication elsewhere. Topics included, but are not restricted to the core areas of interest that include the challenges, opportunities and pitfalls in collaboration and cooperation between organizations, across borders and between consumers, retailers and suppliers. The journal also deals with areas that contribute to improved supply chain workings including improved consumer insight and understanding, better marketing and merchandising, logistics, the evolution of retail formats, use of data, technology, and standards. For more details, see “Call for Papers” link. To make sure that you can receive messages/ e-mails from us, please add “ijbcnet.com” domain to your e-mail ‘safe list’. If you do not receive e-mail in inbox, check your “Junk Mail” or “Bulk Mail” folders.